Ukrainian pilot Nadiya Savchenko was taken to the remand prison of Novocherkassk, Rostov region [Russia], which contains the most dangerous criminals. Nadiya was brought in a special wagon, attached to a conventional passenger train, at 19:30 [EET] at the station in Rostov-on-Don. According to LifeNews, before opening the wagon car, officers of the Federal Penitentiary Service formed a human chain from the wagon to a Volkswagen Transporter minibus. From Rostov-on-Don, the van went to the №3 Novocherkassk detention facility. Nadiya was transported to the detention center (SIZO) at 21:35 [EET]. 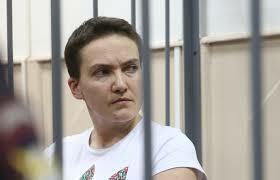 Previously it had been reported by Radio Free Europe Radio Liberty that Savchenko was taken to a prison in Shakhty.